Which of These 5 Bartenders Will Be Named L.A.'s Best? Angeleno cocktailians, start your engines. 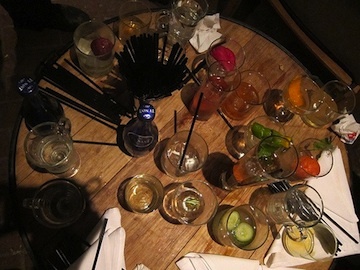 The five finalists of the 2nd Annual L.A.’s Best Bartender Competition have been announced. Now, we knew last week that Joseph Brooke of Next Door Lounge won as People’s Choice and therefore automatically earned a spot as a finalist. But who are the other four he’ll be going up against in the final showdown? Bartenders representing all over Metro L.A., to answer that question. Two were selected based on a blind taste test of fifteen submitted recipes incorporating Karlsson’s Gold Vodka. Two others were selected by the same judges panel of Marcos Tello, Matt Biancaniello and David Kaplan with Alex Day. 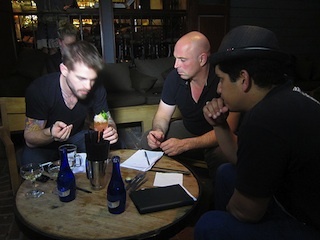 And what a night it was at 1886 in Pasadena, with Marcos Tello stepping up to the stick to make all fifteen cocktails up for judging. After all, consistency is key in cocktails. A maximum of five ingredients in each recipe were allowed, with guidelines to “keep it simple” for the purposes of re-creation. Alas, complications arose as they always do when it comes to boozing. For instance, a recipe with passion fruit appeared and those in charge of shopping for recipes could not find the tropical fruit at any local grocer. But passion fruit - a whole crate, that is - could be found in the trunk of Matty B’s car. “Were you surprised?” teased Kaplan. With one taste of Biancaniello’s imaginative cocktails and one look at his Library Bar, itself easily mistakable as a mini farmers&apos; market, we had to admit: No, we really weren’t. With seasonal ingredients being one issue, another issue in the same vein was keeping the recipe simple. This meant that rare, infused syrups in a recipe submission warranted a mental judges’ docking in points. More than a few drinks had to be remade - either for the purposes of judging the top dog cocktails - or even to actually make cocktail correctly (blame a mislabeled bottle). It made for a very long and taxing judges panel tasting. At the end of the 5-hour night, all judges and bystanders - but especially judges - were spent. You may envy them for having access to all that booze, but certainly not for having to choose the best of the best. Stay tuned next Monday (September 29) for ticket sales to go live for the October 9th event. You won’t want to miss the best mixologists in the city go head-to-head. It’ll be a fun one with Barkeeper’s pop-up store, IceIceShavie.com serving booze-filled snow cones and of course, an opportunity to try some carefully crafted Karlsson Gold Vodka cocktails. You’ll even get to take the recipes home.